All transactions are safe and secure with a reliable history in online purchasing behind each of our associates. 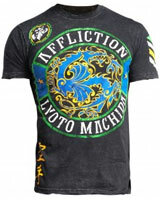 Buy the UFC Affliction shirts to own UFC clothing and merchandise. Enter the Octagon in a bestselling official Affliction UFC t-shirt. Choose from an array of attractive designs that incorporate the Affliction UFC logo and other elements. The letters UFC stand for "Ultimate Fighting Championship", the largest mixed martial arts organization in the world. This tee will help you to win the "best dressed" title when you enter the UFC Octagon. If only that was all you had to worry about. Wear this UFC apparel item to your next main event underneath a comfy UFC sweatshirt for a killer combo. In addition to the UFC Affliction tees above, browse the UFC Clothing Gallery for more apparel like men's and women's clothes, kids shirts or hoodies.